The Haunted Mansion at Walt Disney World is so ghoulishly delightful that it beats the Disneyland counterpart. Photo by Kuleen Lashley, Kid at Heart TravelingMom. Disney fans, have I got a question for you. 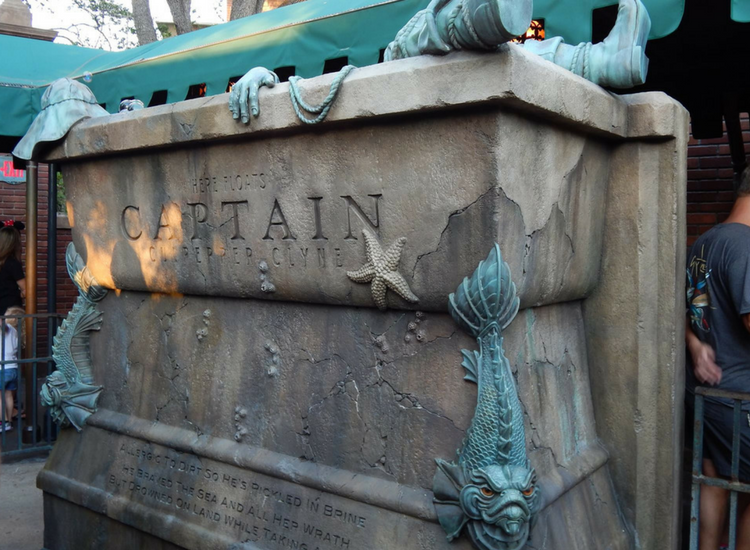 So, if you’ve been to Walt Disney World AND Disneyland, you may have noticed some differences to popular attractions, specifically The Haunted Mansion. You know where I’m going with this: which Disney park has the better Haunted Mansion attraction? I’m firmly on Team Walt Disney World on this one, but to be fair, we’re taking sides here at TravelingMom to choose which one wins the popular vote! Ahh, Fall. My favorite time of year to plan a Disney trip. Hello, who doesn’t love Mickey’s Not-So-Scary Halloween Party? And the premiere attraction for the season hands down is the Haunted Mansion. So I was recently chatting with my friend and fellow Candid TravelingMom Patty and we started dishing on who does the Haunted Mansion better-Walt Disney World or Disneyland? We’re Disney buddies for sure, but on this point, we did not see eye to eye. I’m Team Walt Disney World, and she’s Team Disneyland. Hey, we can still be friends. We agree to disagree–kind of reminds me of politics! 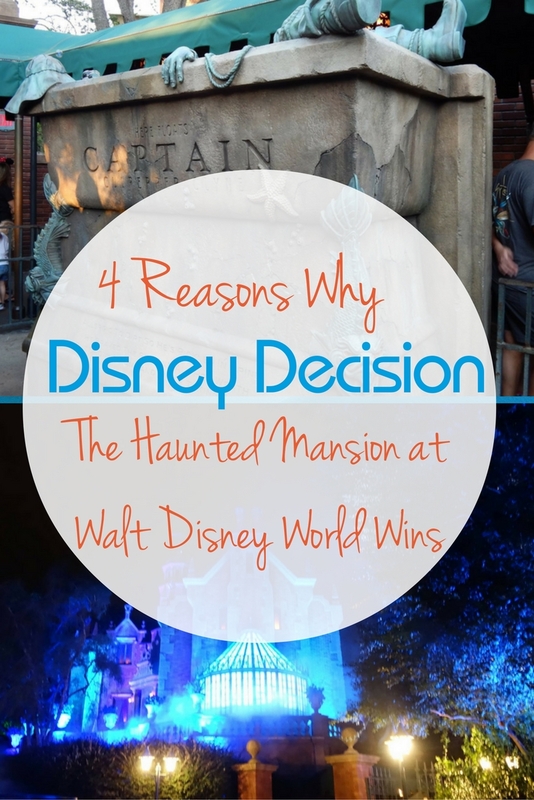 So Patty and I have agreed to debate this hot button issue by breaking down the reasons why OUR favorite Haunted Mansion should be voted the BEST Haunted Mansion. And that’s where you guys come in! We need your votes I mean comments that will indicate which one is the clear people’s choice. No hanging chads, no runoffs, just weigh in and choose by taking a few seconds to comment on your favorite. And every vote counts! Now this is an election I think everyone can get behind in 2016! Just as there are 4 unfortunate souls in the stretching gallery of portraits as you enter The Haunted Mansion, there are 4 reasons why The Haunted Mansion at Walt Disney World gets my vote over Disneyland. The comparison starts the moment you see the foreboding mansion in Liberty Square. The Haunted Mansion is totally creepy. Casting a macabre and sinister shadow, The Haunted Mansion is much more intimidating than the Southern style mansion in New Orleans Square in Disneyland. Then again, I may be biased because I’m a Southerner and the New Orleans/Southern mansion style doesn’t scare me at all. 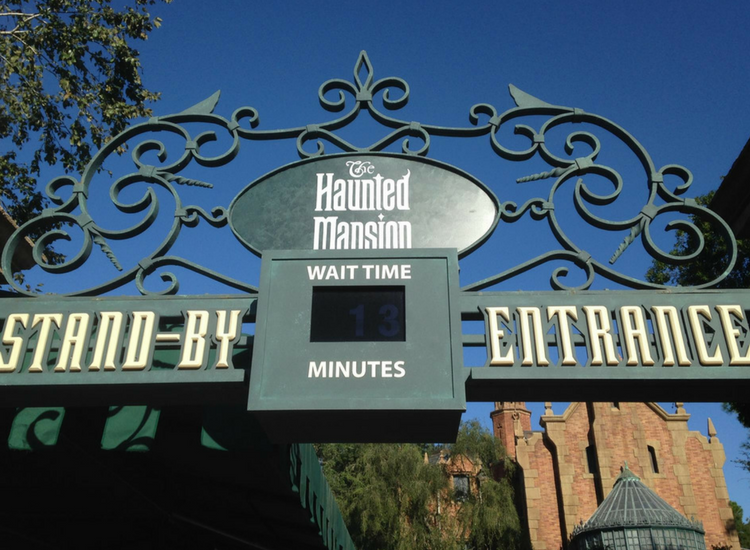 13 minutes is The Haunted Mansion code for “no wait.” Photo by Karyn Locke, Road Trip TravelingMom. Even the Stand-By entrance sets the tone: a no wait time doesn’t read 5 minutes like other attractions, but rather lucky number 13 minutes. Nice touch! 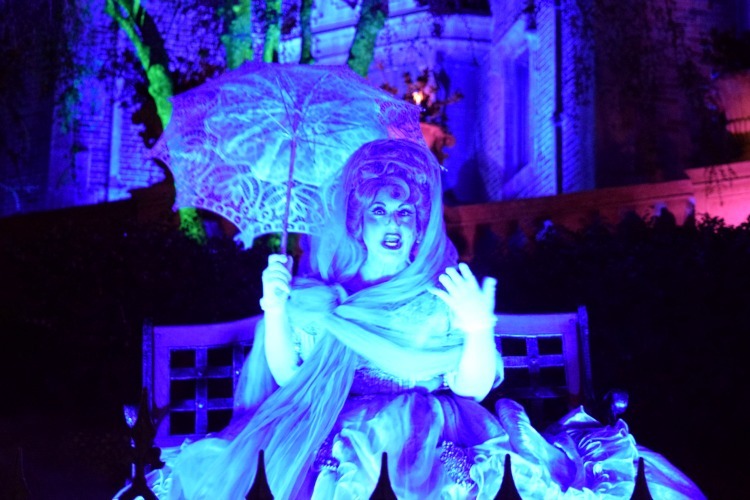 Madame Renata casts a spell on the crowd at The Haunted Mansion at Walt Disney World. 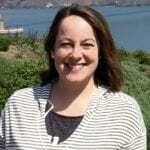 Photo by Karyn Locke, Road Trip TravelingMom. And then we have the special Halloween parties. Madame Carlotta and Madame Renata both take turns entertaining guests while seated on the lawn in front of the attraction for the evening. The graveyards are out to kill it with special lighting and filled with fog. “Serpents and spiders, tail of a rat; call in the spirits, wherever they’re at!” Well, one place those spirits are hanging out is the queue area for The Haunted Mansion. 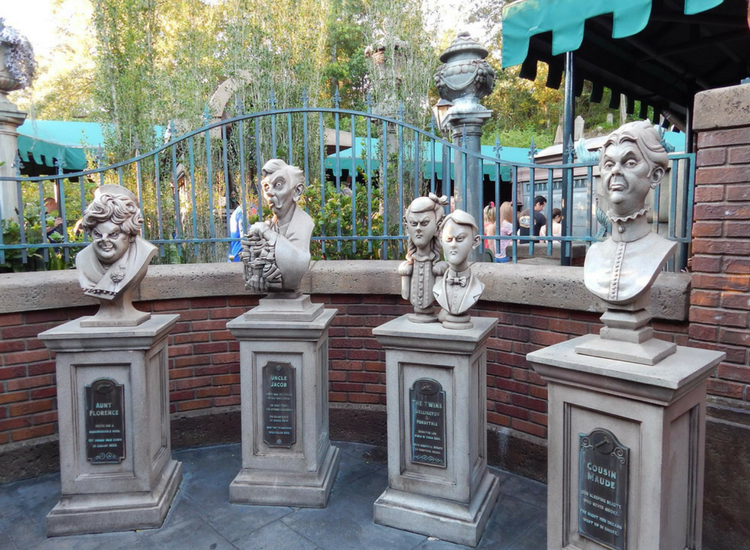 From the busts to the crypts that honor Imagineers, all the Disney touches you’ve come to expect are there. Waiting never was so fun with an enhanced queue area. Photo by Karyn Locke, Road Trip TravelingMom. The Haunted Mansion at Walt Disney World will have you BUSTING out laughing. Photo by Karyn Locke, Road Trip TravelingMom. But the most impressive improvements involve Madame Leota. Madame Leota’s crystal ball now levitates about the table new candles on the table and a new spell book on the seance table. You’ll be under her spell before you know it! The technical improvements using rear-projection allowed the Imagineers to use a full high-resolution image for Madame Leota’s face (as opposed to Disneyland’s projected “bouncing ball” image). The result is more life-like and stunningly clear. Finally, who doesn’t love special effects in their photography? PhotoPass ups the ante with their photo enhancements during Mickey’s Not-So-Scary Halloween Party, where those famous 3 haunts escape the mansion to get in a photo with you! “And a ghost will follow you home!” Literally it looks like they did! Halloween haunts leave the ride and pose along with you via Photo Pass special effects at The Haunted Mansion at Walt Disney World. Photo by Sherry Boswell, Melodious TravelingMom. Disneyland may have done it first, but Walt Disney World’s The Haunted Mansion does it bigger and better. The attraction is slightly longer and more elaborate at Walt Disney World. Additionally, there are 160 Doom Buggies at Walt Disney World compared to the 131 vehicles at Disneyland. 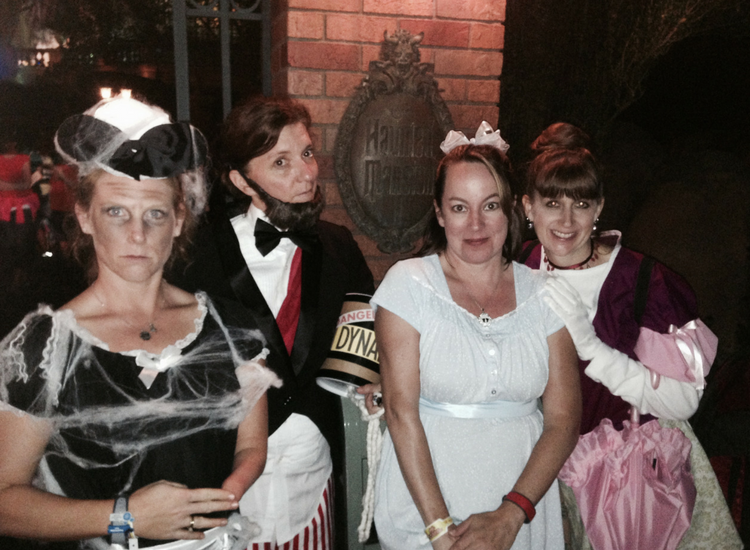 My friends go all in when dressing up for Mickey’s Not-So-Scary Halloween Party. Photo by Sherry Boswell, Melodious TravelingMom. 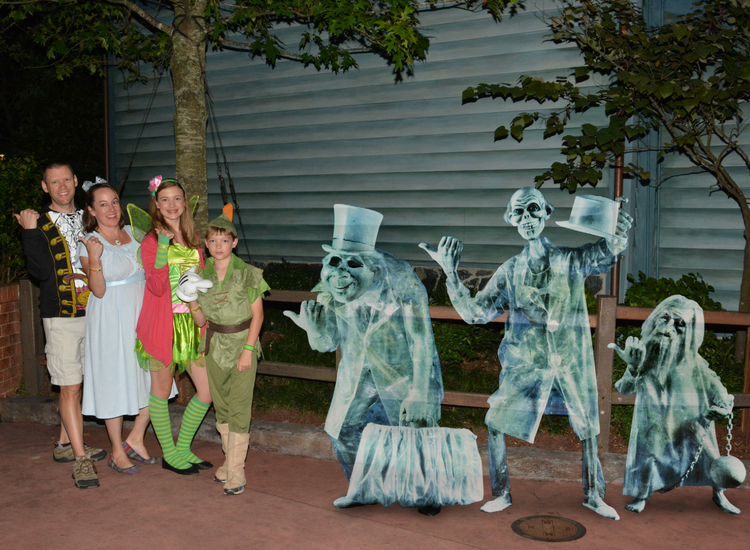 “Beware of hitchhiking ghosts!” No, these aren’t ghosts, they are my incredibly creative friends who chose to dress up as Haunted Mansion inspired characters for Mickey’s Not-So-Scary Halloween Party. So “foolish mortals”-what do you think? Does Walt Disney World’s version of The Haunted Mansion win this one? Or are you with Patty and think Disneyland’s offering is better? Don’t forget to vote below—and it must be a comment on our TravelingMom posts! We will announce the totally scientific results on Friday, October 28th! I am 100% Disneyland Haunted Mansion!!! The Nightmare Before Christmas theme is unmatched. I wish World would partake in this inventive ride mash up! Plus they have an actual cemetery where pets have been buried at Land… If that’s not spooky I don’t know what is. Aww darn-I was hoping you were voting for WDW! But I get it. A pet cemetery would give me the heebie jeebies! Well, your friend has 5 reasons why Disneyland Haunted Mansion is better and you have 4……so, I think Disneyland wins lol. Apart from that, an elevator is way spookier than a stretching room. All haunted mansions, be it at Disney or elsewhere have an elevator thay usually drops to terrify you. The plantation is what makes it even better. It looks so inviting, BUT as you approach you realize something is wrong. It’s just too late to turn back. At WDW, you already know what you’re getting into. Defeats the purpose of getting scared. If you really want something creepy, check out Phantom Manor on YouTube. That’s the haunted mansion at Disneyland Paris.